Dental laboratory technicians (DLTs) specialize in the creation of dental appliances such as dentures, bridges, or crowns from synthetic materials. 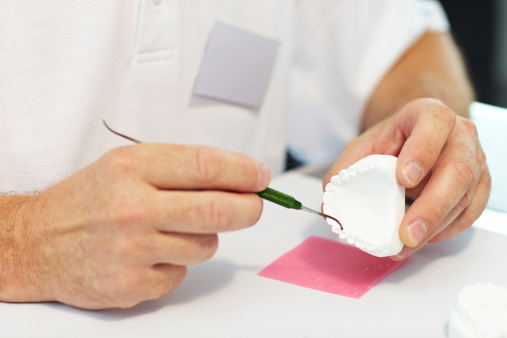 Dental technicians work closely with dentists and use personalized molds of the patient’s mouth to create appliances. They have little to no interaction with patients though. Technicians can come from a variety of educational backgrounds and may specialize in the use of specific materials like ceramic or porcelain. The job outlook for dental technicians is expected to remain steady for the next several years and annual salaries can fall between $30,000 and $35,000 per year. What duties do dental technicians have? Depending on the level of training a dental technician has (high school diploma, associate or bachelor’s degree), job duties may vary slightly. However, all technicians follow detailed instructions from a dentist to create dental appliances from synthetic materials. DLTs create dentures, partials, crowns, bridges, veneers, and other customized dental devices based on plaster molds of the patient’s mouth. Most will use small sculpting devices like files and polishing tools to shape teeth and create a natural blend with the patient’s existing teeth. Dental technicians also make repairs to damaged dental appliances and test final pieces for quality and fit before sending them to the ordering dentist. Most will work in a comfortable laboratory environment for a large laboratory or for a dentist’s personal practice. Discover new opportunities available today. Dental technicians are a lot like sculptors. A steady hand and good hand-eye coordination are important. You will need to be comfortable using small tools like polishing devices or files and will need a little bit of an artistic edge to properly shape the appliance. Because much of the work takes place on small items or in small spaces, a good dental technician will be able to pay close attention to detail and work with accuracy. Good time management skills and working efficiently is also important. You get to be an artist. If you have an artistic edge, you’ll be able to embrace it as you use shape and form to create a natural looking final product. Flexibility and opportunities to advance. Dental technicians can choose to work in a variety of settings including commercial labs, or their own independent business. Other dental technicians move up the ladder to become professors and educate new dental technicians. The work is tedious. Working with small teeth and little details can take a toll on your body and your patience. There are sure to be days when focusing and working so carefully will feel daunting. The work may all rely on you. In many cases, the dental technician may be required to handle a project from concept to final product. This may be a good or a bad thing depending on the individual but be sure there will be times when you will work on your own. You work your way up. According to the Bureau of Labor Statistics, many dental lab technicians start with only a high school diploma and learn on the job. Technicians who start this way can expect to perform very basic tasks—such as mixing plaster for molds—until they gain experience. Associate degree training. Associate degrees in dental laboratory technology can be found at a variety of community and technical colleges across the country. Most programs will take 2 -3 years to complete. Bachelor degree training. A bachelor’s degree takes four years to complete and will be offered at a college or university. The American Dental Association recommends a bachelor’s degree but it’s not required. Keep in mind though that advanced training will equal a hiring advantage when it’s time to start looking for a job.Certification is available through the National Board for Certification in Dental Laboratory Technology. Certification may be obtained in specialty areas of the field including complete or partial dentures, crowns and bridges, ceramics, orthodontics or implants. Being certified shows your commitment to quality service and continued education, and may be valued—if not required—by a potential employer. The pay scale for dental laboratory technology will vary slightly depending on your work setting, where you are located in the country, and what education or certifications you hold. Most DLT’s make about $35,000 per year. Technicians on the higher end of the pay scale make about $58,000 per year and the low end just $20,000. While there are many branches of dental care including dentists and hygienists their jobs are vastly different from a dental laboratory technician both in duties and training. Medical appliance technicians, though they work with areas that don’t involve teeth, do create assistive devices to help patients live better lives. These technicians construct, fit, and repair supportive devices such as prosthetic limbs, facial parts or foot and leg braces. Medical appliance technicians make about the same amount of money as a DLT, but job growth is expected to be slower than average over the next several years. Thanks to the flexibility and national demand for DLTs, there are plenty of opportunities to travel. From large dental laboratories to small practices, there are a variety of opportunities to see new places and meet new people. As with any traveling job, DLTs should have established skills and be prepared to work without the guidance or additional training of their employer. We're committed to finding you the right career opportunity.